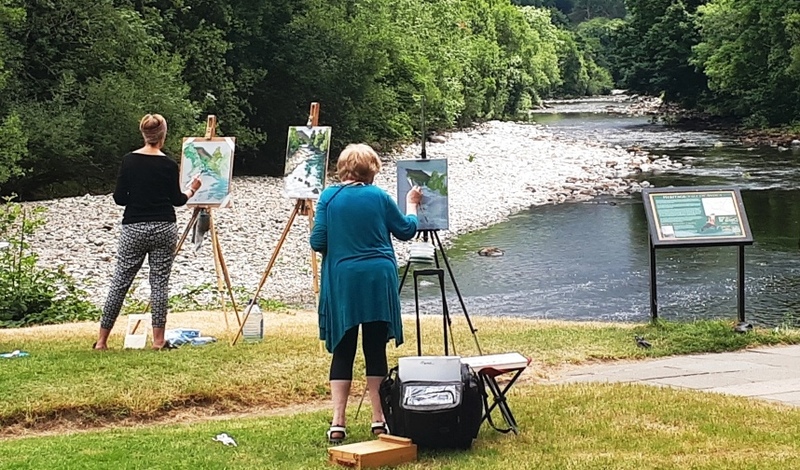 Rod Coyne’s September 2019 Painting Workshop promises quality time channeling St. Kevin’s hermitage on the shores of the upper lake, Glendalough. Rod Coyne students discover the beauty of the Upper Lake in the Glendalough Valley. 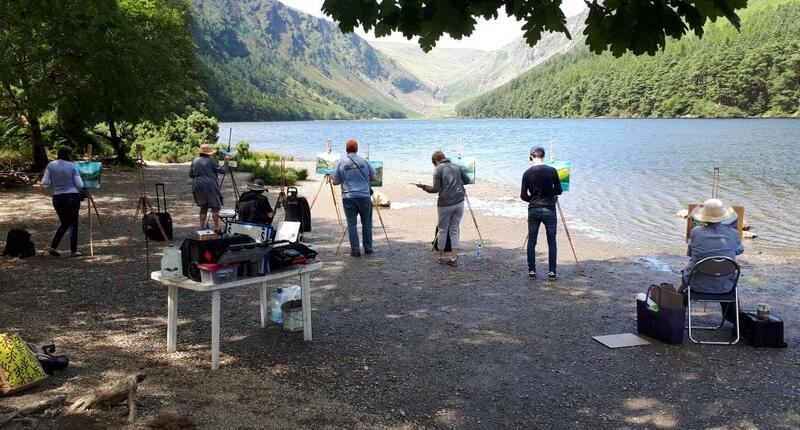 September 2019 Painting Workshop at Glendalough – What’s included? 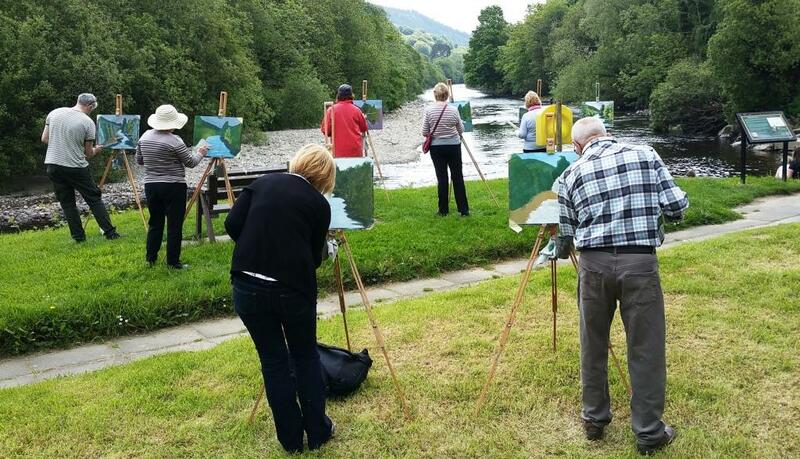 We meet at this scenic Wicklow location at 10am when Rod Coyne provides a drawing/painting demonstration which is a most noteworthy introduction before the group start their own art works. Throughout the day Rod always is on hand with individual tips and techniques as a result appropriate to each student’s level. There is a much needed break for lunch before finally completing the days work at 4pm. The emphasis is on enjoying the painting process in an informal, friendly atmosphere, and above all joining in the group dynamic. The workshop is suitable for beginners to experienced painters. August 2019 Painting Workshop at the Meetings of the Waters with Rod Coyne is designed to capture the spirit of Thomas Moore. It was Moore who immortalised the river’s conjunction therefor putting the Vale of Avoca on the map for generations to come. Students capture the river’s light and movement with Rod Coyne at Meetings of the Waters. August 2019 Painting Workshop at Meeting of the Waters – What’s included? Creating new “Rod Sees Red” canvases is always a pleasure for Rod Coyne. And knowing that these paintings will be going straight to exhibition makes it doubly sweet. So it’s no wonder that the artist got all excited when asked to join a Dublin Christmas show just as he was finishing his new series. “Christmas Stocking Fillers 2018’, is a unique show at The Doorway Gallery where all the canvases are the same size and all under €500. This spectacular exhibition provides you with the rare opportunity to begin collecting works of art by your favourite artist, at very affordable prices. All of the gallery’s artists, throughout the year, have been working tirelessly towards this show, creating new work. This exhibition runs till 24th December 2018. Based on a Co. Mayo landscape Rod Coyne’s “Crimson County” 20x25cm, acrylic on canvas is a familiar yet decidedly odd Irish landscape. Coyne’s “Downpatrick (Red)head” is a modest 20x25cm but packs the punch of a heavyweight. It’s acrylic on canvas and has been dropping jaws since it went up on the wall in Dublin’s iconic Doorway Gallery. It’s no coincidence that the Wild Atlantic Way has been the darling of Irish tourism. Celebrating this wild beauty Rod’s “Achill Rouge” bows its head in awe. It’s a mere 20x25cm, painted in acrylic on canvas, and could be yours for €475. Not far south of the artists home Waterford’s “Copper Red Coast” is a gem in Ireland’s Ancient East. And Rod’s, 20x25cm, acrylic on canvas depicts it in full glory. It’s hard to image that the “Red Road” is not derived from the red planet, yet it truly is an Irish landscape given Coyne’s other treatment. “Turning the landscape red has allowed me an opportunity to emphasize the Irish Sea’s natural palette of greens and the juxtaposition of the the two colours transfixes the viewer’s eye, “ according to Rod Coyne. This vibrating colour collision is nowhere more apparent than in his “Red County” painting, 20x25cm, acrylic on canvas. A selection of Rod’s new canvas displayed alongside some of the other great works available at the Doorway’s Christmas Stocking Filler exhibition. Three of Rod Coyne’s paintings on display in Doorway Gallery, Dublin. Find out full exhibition details here. See what else Rod’s has been up to artistically on Facebook.